This is a guest blog post from my dear friend Gloria, an eclectic, ironic and multi-talented Tuscan. She is a linguist pursuing an academic career, runs a popular travel blog, a couple of holiday rentals, collaborates to all sort of other projects I’ve lost track of, and she is – of course – an excellent cook. I have tasted and loved this hearty stew at her country home in Southern Tuscany. It’s perfect for a chilly fall evening after a long walk in the woods. Il Peposo, also known as Peposo del Chianti or Peposo alla Fornacina, is one of the most ancient dishes of the Tuscan cuisine. Despite the fact that it is a meat dish, it belongs in all respects to the “cucina povera”, that is, the culinary tradition of the humble households which resorted to simple, inexpensive and easily available ingredients. Il Peposo was traditionally a hearty meal for the kiln workers of the Chianti (hence the name Peposo del Chianti). They spent long hours by the kiln making terracotta tiles and utensils and they took advantage of the heat from their ovens to slow cook the meat in pots placed just outside the kilns (hence the name Peposo alla Fornacina, as fornace is an Italian word for kiln). In the area where my village is located, south of Siena, on the border with the Maremma, Peposo was usually eaten by wood charcoal workers, also named charcoal burners or colliers. They would place their pots of Peposo on top of the turf piles under which the wood was slowly burning. In the woods which surround the village, some of the old wood charcoal burning sites are still visible in the growing underwood, and it is quite common to see pieces of broken terracotta pots scattered around the ground. Peposo is a very easy dish to prepare. It can be prepared either in a terracotta pot in the oven or in a pot with a heavy lid on the stove (that is what I do, which is also the traditional way around here). For this dish, you need a “poor” cut of meat rather than a tender, good quality cut, because, otherwise, the meat would melt in the slow cooking process. 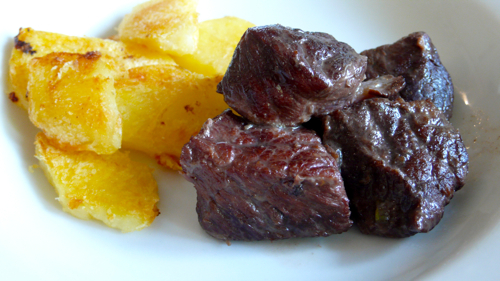 Traditionally, Peposo was made with scraps: the “worst” pieces of beef meat that were relatively cheap to buy. Stewing steak, better if with a bit of fat or callosity, is usually ideal. If you can only find a good cut of beef, then it’s necessary to reduce the cooking time. With the right type of meat, you will typically need 3 hours. Preheat the olive oil in a Dutch oven and briefly sauté the garlic cloves. Add the peppercorns, the sage and the meat and sear for 5 minutes, until the meat has a nice brownish colour on all sides. Pour in the wine, cover and let it simmer on very low heat or in the oven at 150 °C (300 F°). When the wine starts to reduce, add 4 cups (1 lt) hot water and let simmer slowly for 2 hours, checking regularly to see that the liquid has not evaporated completely. If the liquid dries up, add some more water to cover the meat. After 2 – 2 1/2 hours, remove the lid, and let the liquid evaporate until the meat is left in a thick brown juice. There is usually no need to add salt. Some people add a few tomatoes to the meat, which results in a creamier dish. Il Peposo is best accompanied by a good, hearty red wine, and possibly a salad to compensate for the rich taste of the meat. Some people serve Peposo on stale or toasted Tuscan bread. If you choose to do that, don’t let the juices evaporate completely. 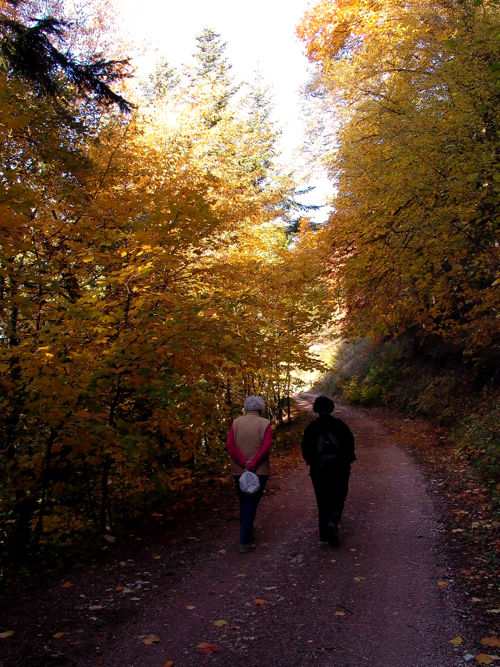 a country walk and a good dinner afterwards, what else do you need? Oh, this sounds lovely and so simple! I’m going to try it. Would I actually ask the butcher for “carne povero”? He won’t laugh? Gloria, your rental home looks charming, too, and I’ll keep it in mind for a long-overdue trip to Tuscany. Grazie! Jann thanks! Here in Italy you just ask the butcher for carne da spezzatino and he will know what you mean. I just came home with a boneless chuck roast. I think I can just cut it up and make this. Anything I am missing in this thought? I’ve been wanting to try peposo for a long time. Now you’ve inspired me… it’ll be on the menu very soon! thanks Frank, it’s fabulous for a party as it can be prepared ahead and briefly reheated before serving. I love peposo. I tried it for the first time last year and I fell in love. The pepper makes this stew so warm , it is perfect for a winter night! grazie Paola e buona fortuna con il tuo dottorato! A Kitchen with a view e-book, from my kitchen to yours!